Saliva: You probably haven’t given it much thought throughout your life. It’s simply a part of you, like your hair, your eyes, your toes. Yet, saliva plays a significant role in maintaining healthy teeth and gums, and could even be an indicator of your overall health. 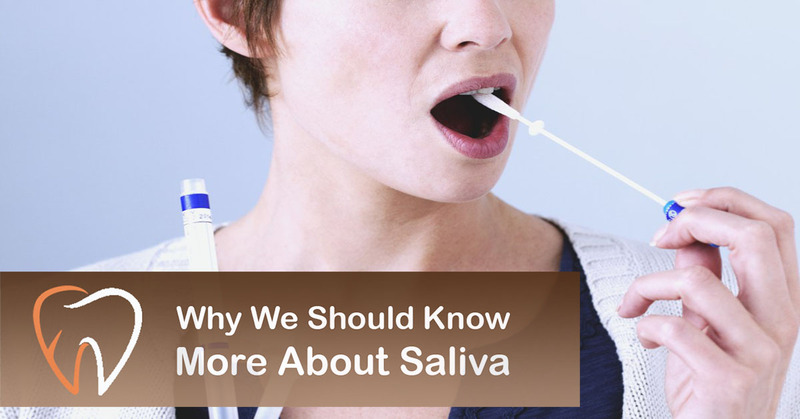 Why is saliva important? According to the American Dental Association, saliva “acts as the bloodstream of the mouth,” which helps to “build and maintain the health of soft and hard tissues.” It breaks down food to allow chewing, swallowing and digestion. It helps you taste your food. It washes away food particles and bacteria from your teeth, and fights bad breath, infection and tooth decay. In addition to maintaining good oral health and hygiene, saliva is proving to be beneficial in screening for a variety of diseases. Biomarkers in the blood are also present in saliva; therefore, doctors may use saliva to gather information on what might be happening in other areas of the body. Because it is easy and noninvasive to collect a saliva sample, saliva could someday be used more commonly in lieu of urine or blood testing. Salivary bioscience researchers are continuing to study how saliva can help diagnose, not only oral diseases, but also HIV, diabetes, heart disease, pancreatic and breast cancers, and more. A person typically produces 90-100 gallons of saliva per year, enough to fill a bathtub. The amount of saliva you produce is controlled by the nervous system. That is why your mouth gets dry when you are anxious or upset. Colds and flu, cold sores, mononucleosis, strep bacteria, and hepatitis B can all be transmitted by saliva. Wounds in the mouth heal faster and more efficiently than wounds in other parts of the body, thanks to a molecule found in saliva. Want to learn about your ancestry? Services like 23andMe and AncestryDNA now make it easy to trace your roots, simply by sending in a spit sample. There is a lot we can learn from our spit. For more questions about saliva and your overall health, or if you suffer from dry mouth, be sure to visit. Contact us to set up an appointment and learn more.